When paying suppliers who regularly have a large number of invoices with the same amount, it is very confusing to not know which invoices have been paid and which ones have not. Is it possible to include this info? However, the date of the invoice isn’t on there. I’ll check this with a colleague though and see if this is possible. I just wanted to let you know that we’ll have a look at this in a bit more detail and see if having the invoice date shown is feasible. We’ll update this topic once we’ve had a chance to have a look. Thanks - this looks like what I need. How do I go to be able to send a remittance advice to a suppliers with all payments made in one day or period? Which would be shown in a list like the shown above? Though the “all payments” view only has the QFnnnnn reference numbers, not the supplier’s own reference. If I go to an unpaid invoice then I have the “Log payment” button at the top. If I go to a paid invoice I do not have a “Payment” link at the top…? So I can’t really follow the steps. What am I missing? Sorry to be a pain, but I still don’t know what I need to do to get the list of payments made. What I do not know is how to send the selected list of payments to the supplier, showing payments made. There isn’t a way to send it direct from there, but what you can do is download it (select ‘Print’), and email the PDF. As far as I know you can’t easily do this. You can generate the remittance advice slip as @QFMathew describes above for one single payment showing the supplier reference numbers of all the purchases it was attributed to, but not for all payments in a particular date range. You can get a list of payments made to a particular supplier via “purchases -> view payments” and use the advanced search options to filter by supplier and by date, but that view only shows you the internal QuickFile reference numbers for the purchases, not the supplier’s reference. That is correct - ideally I would like to have that. However I could work with a workaround solution. I went and did the “purchases->view payments” and did the advance search. That is the information that I could use, because it shows the date of the invoice. However there is no way I can send that or a selection of that to my suppliers. Even if I do export the data (which I would not want to as it’s more long winded) the exported data only shows payment date, not the invoice date. I wonder if that could be added at least? I think all the information is there, it just needs a button to email the selected payments to the supplier (including invoice date at least, as without invoice date or invoice number the supplier won’t know what exactly has been paid). I wonder if I am among the few ones needing this? We always change the allocation date to actual date of the invoice - so that we always have the date of invoice in the system. Otherwise we would not know date of invoice and invoice number unless we open the attachment (invoice/ receipt itself). The odf option is cumbersome as we always pay invoice by invoice - not cumulative payments. So it would mean a lot of print - save - email activity. Is there a way to create something with the data in the system that can be emailed automatically? I believe that the “send email notification to supplier” is exactly what I want, if I at least could have the invoice date/ allocation date that would become really relevant to the supplier. I understand that as invoice date is not actually taken in QF (as it creates its own QFxxxxxx reference) it may be more difficult, but at least the date and the amount (amount is already shown in the respective email, so just date is needed) would give the email the weight of real, useful information. Not wanting to repeat myself, but basically the facility is already there, we just need the system to pick up the invoice/ allocation date. Can something similar be created by just adding invoice/ allocation date? 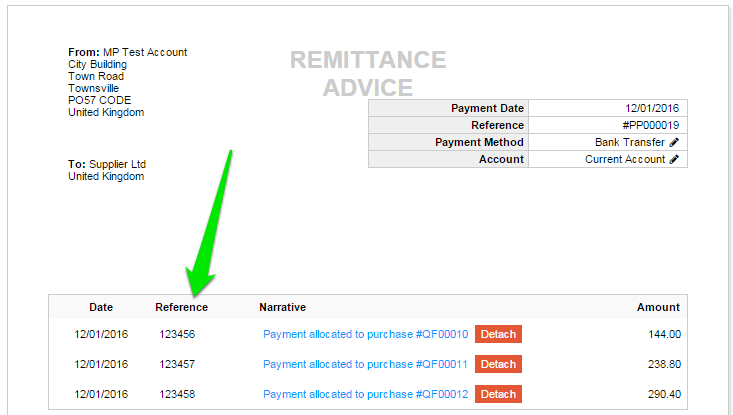 I agree, on remittance advice the invoice date should appear next to the invoice reference not the payment date. I think it would also be good to have the narrative column to show the invoice description if possible. 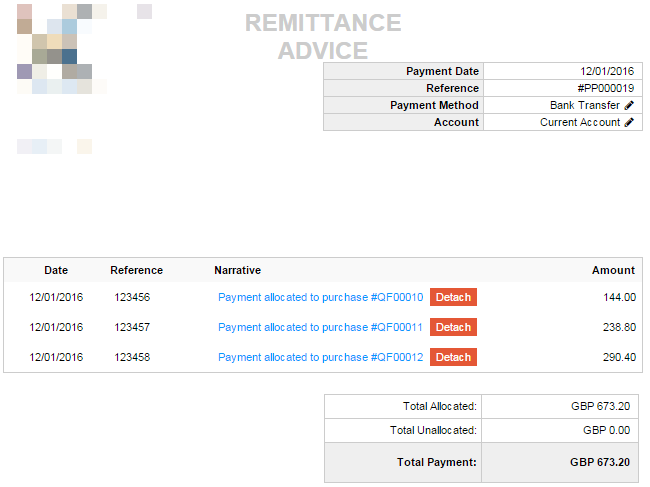 One more suggestion is why can’t I automatically send remittance advice when tagging a bank transaction to multiple invoices from a supplier in one go? I can send it automatically if it’s just one supplier invoice that’s being tagged but not multiple, this makes sending remittance advice to suppliers quite a laborious process. Thank you for your comments - we’ll continue to monitor the interest in this thread. When I enter a payment for a single invoice there is an option to email a receipt. Not so when multiple invoices are paid?